Manufacturing engineering or manufacturing process are the steps through which raw materials are transformed into a final product. The manufacturing process begins with the product design, and materials specification from which the product is made. These materials are then modified through manufacturing processes to become the required part. Modern manufacturing includes all intermediate processes required in the production and integration of a product's components. Some industries, such as semiconductor and steel manufacturers use the term fabrication instead. The manufacturing sector is closely connected with engineering and industrial design. Examples of major manufacturers in North America include General Motors Corporation, General Electric, Procter & Gamble, General Dynamics, Boeing, Pfizer, and Precision Castparts. Examples in Europe include Volkswagen Group, Siemens, FCA and Michelin. 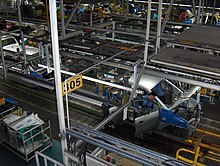 Examples in Asia include Toyota, Yamaha, Panasonic, LG, Samsung and Tata Motors. In its earliest form, manufacturing was usually carried out by a single skilled artisan with assistants. Training was by apprenticeship. In much of the pre-industrial world, the guild system protected the privileges and trade secrets of urban artisans. Before the Industrial Revolution, most manufacturing occurred in rural areas, where household-based manufacturing served as a supplemental subsistence strategy to agriculture (and continues to do so in places). Entrepreneurs organized a number of manufacturing households into a single enterprise through the putting-out system. Toll manufacturing is an arrangement whereby a first firm with specialized equipment processes raw materials or semi-finished goods for a second firm. Emerging technologies have provided some new growth in advanced manufacturing employment opportunities in the Manufacturing Belt in the United States. Manufacturing provides important material support for national infrastructure and for national defense. On the other hand, most manufacturing may involve significant social and environmental costs. The clean-up costs of hazardous waste, for example, may outweigh the benefits of a product that creates it. Hazardous materials may expose workers to health risks. These costs are now well known and there is effort to address them by improving efficiency, reducing waste, using industrial symbiosis, and eliminating harmful chemicals. The negative costs of manufacturing can also be addressed legally. Developed countries regulate manufacturing activity with labor laws and environmental laws. Across the globe, manufacturers can be subject to regulations and pollution taxes to offset the environmental costs of manufacturing activities. Labor unions and craft guilds have played a historic role in the negotiation of worker rights and wages. Environment laws and labor protections that are available in developed nations may not be available in the third world. Tort law and product liability impose additional costs on manufacturing. These are significant dynamics in the ongoing process, occurring over the last few decades, of manufacture-based industries relocating operations to "developing-world" economies where the costs of production are significantly lower than in "developed-world" economies. 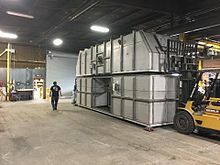 Manufacturing has unique health and safety challenges and has been recognized by the National Institute for Occupational Safety and Health (NIOSH) as a priority industry sector in the National Occupational Research Agenda (NORA) to identify and provide intervention strategies regarding occupational health and safety issues. Attractiveness to foreign direct investors. On June 26, 2009, Jeff Immelt, the CEO of General Electric, called for the United States to increase its manufacturing base employment to 20% of the workforce, commenting that the U.S. has outsourced too much in some areas and can no longer rely on the financial sector and consumer spending to drive demand. Further, while U.S. manufacturing performs well compared to the rest of the U.S. economy, research shows that it performs poorly compared to manufacturing in other high-wage countries. A total of 3.2 million – one in six U.S. manufacturing jobs – have disappeared between 2000 and 2007. In the UK, EEF the manufacturers organization has led calls for the UK economy to be rebalanced to rely less on financial services and has actively promoted the manufacturing agenda. List of top 20 manufacturing countries by total value of manufacturing in US dollars for its noted year according to Worldbank. ^ "Manufacturing Program | NORA | CDC". www.cdc.gov. 2019-02-11. Retrieved 2019-03-14. ^ "National Occupational Research Agenda for Manufacturing | NIOSH | CDC". www.cdc.gov. 2019-02-04. Retrieved 2019-03-14. ^ Manufacturing & Investment Around The World: An International Survey Of Factors Affecting Growth & Performance, ISR Publications/Google Books, revised second edition, 2002. ISBN 978-0-906321-25-6. ^ Research, Industrial Systems (2002-05-20). Manufacturing and Investment Around the World: An International Survey of Factors Affecting Growth and Performance. ISBN 978-0-906321-25-6. ^ Bailey, David and Soyoung Kim (June 26, 2009).GE's Immelt says U.S. economy needs industrial renewal. UK Guardian. Retrieved on June 28, 2009. ^ "Factory jobs: 3 million lost since 2000". USATODAY.com. April 20, 2007. ^ "Manufacturing, value added (current US$)". access in February 20, 2013. ^ "Manufacturing, value added (current US$) for EU and Eurozone". access in February 20, 2013. ^ "Manufacturing, value added (current US$) | Data". data.worldbank.org. Retrieved 2018-11-11. Kalpakjian, Serope; Steven Schmid (August 2005). Manufacturing, Engineering & Technology. Prentice Hall. pp. 22–36, 951–88. ISBN 978-0-13-148965-3. Look up manufacturing in Wiktionary, the free dictionary. Wikimedia Commons has media related to Manufacturing. Manufacturing Sector of the National Occupational Research Agenda, USA, 2018. "Manufactures" . New International Encyclopedia. 1905.